Gillibrand just made it official! We’re taking the two weeks remaining in Women’s History Month to celebrate the ways our four leading women running for president have been first—shattering ceilings along the way to hopefully shattering the biggest glass ceiling in 2020. We’re shining the spotlight first on Sen. Kirsten Gillibrand, who announced her official candidacy last weekend. Since entering Congress in 2007, Sen. Gillibrand has made a point to be first: Right after taking office, she stood up for transparency and good government by becoming one of the first members of Congress to publish her official schedule and personal finances and tax returns. And she showed again that she wasn’t afraid to stand up to special interests by voting against the 2008 bank bailout, twice. As a Senator, she continued to be out front on issues that matter. 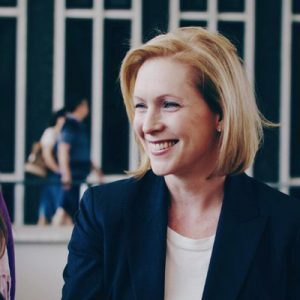 When Congress introduced the FAMILY Act in 2013—the first major overhaul of family leave policies since the 1993 FMLA—it was with Sen. Gillibrand as the lead sponsor. Most recently, she was the first US Senator to call for abolishing ICE. Celebrate Sen. Gillibrand’s firsts and welcome her officially to the race: Give $20 to her and the three other leading women on our Get Them on the Stage slate! Why are we calling it “Get Them on the Stage”? In case you haven’t heard the news: The Democratic National Committee has new rules for how candidates can get on the primary debate stage, and one of those ways is through grassroots donations. Candidates have to get at least 65,000 individual donations, from at least 200 unique donors (per state) in 20 states. We’re striving for gender parity on that stage, to increase the chance that 2020 is the year—100 years after women won the right to vote—that a woman shatters the highest glass ceiling in politics.